LAKE PLACID, N.Y. -- One of the biggest reasons Sweden has been so successful at the last few World Junior Championship tournaments has been the play of its goaltenders. Jacob Markstrom helped win silver and bronze medals in 2009 and 2010, respectively, and Robin Lehner got them to the bronze-medal game in 2011. Both of those players were high NHL draft picks, and were well-regarded before they took the ice for the WJC. However, both those players have aged out of eligibility for the elite international under-20 hockey tournament, leaving Sweden's goaltending situation in a state of flux. Into that opening, though, have stepped Johan Gustafsson and Johan Mattsson, both of whom are here looking to stake their claim to the starting goaltender job for the 2012 WJC. 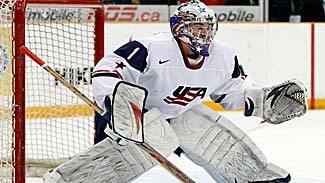 "I think they are really good, educated Swedish goalies," Sweden coach Roger Ronnberg told NHL.com. "They have gone through our program for goalies and they have the size and they have the mental ability to play at this level. It's going to be exciting to follow those guys during this season until the championship." Ronnberg has alternated his two goalies during camp, with Gustafsson stopping 23 of 24 shots in Wednesday's 4-1 win against the U.S.
"They had some chances, but that's how it is in every game," Gustafsson told NHL.com following the game. "When they get their chances it's up to me to step up and stop them." Gustafsson, a 2010 sixth-round pick of the Minnesota Wild, said he's not putting any extra pressure on himself to perform to the level of Markstrom or Lehner. "I don't feel like there's any pressure from them," Gustafsson told NHL.com. "They are two good goalies, but I think I'm a good goalie, too. I believe in myself and I think I can do the work." Mattsson, a 2011 seventh-round pick of the Blackhawks, feels the same way. He stopped 21 of the 22 shots he saw in Tuesday's 7-1 defeat of Finland. "The only thing I can do really is to play my best and keep it at a constant level," he told NHL.com. "Just go out in the game or the practice and give 100 percent." Mattsson will start Friday's rematch against Finland and then get ready for the 2011-12 season with his new team, the Sudbury Wolves of the Ontario Hockey League. He had 2.62 goals-against average and .930 save percentage in 26 games with Sodertalje's junior team, but decided this season he needed a change. "I just thought it was the right choice for me," Mattsson said. "I liked the small rinks. The goalie coaching wasn't consistent in Sodertalje, where I played last year." Gustafsson also will be working with a new team this season. He had a 2.30 GAA and .911 save percentage in 26 games with Vasteras last season, but this season he's making the jump to Lulea in the Swedish Elite League. His goalie coach in Lulea, Daniel Henriksson, also is the goalie coach for the national junior team. "It's been working out great so far," Gustafsson said. "I think I have developed a lot of things in the crease for this year just over the summer … I already feel like I've improved a lot of things, feel a lot stronger." Their teammates certainly have noticed the effort put in by their goaltenders. "This is first time I'm playing with Mattson, but I think he's a pretty good goalie and a nice guy, so I trust him," center Victor Rask told NHL.com. "And Johan Gustafsson, I've known him for a while. I know what he can do and he's a pretty good goalie." Sweden captain Johan Larsson also said he was fine playing in front of either of the two goalies at the camp. "We trust them, they're good goalies," he told NHL.com. "They can do well." Ronnberg said he's not remotely close to naming a starter for the 2012 WJC, which will be held in Calgary and Edmonton from Dec. 26 to Jan. 5. There isn't a lot to differentiate between the two. Gustafsson has a bit more international experience -- he backstopped Sweden to a silver medal at the 2010 World Under-18 Championship and has represented his country on national teams since he was 16 -- but that might be the only edge he has. "I think Mattson, he has developed a little later than Gustafsson," Ronnberg said. "Gustafsson has played more games for us over the years in the national-team program, but right now they seem equal."